Homepage. This page: Two sets of cards to be used with the 3-D Vistascreen viewer. Vistascreen cards featuring old cars. Collecting memorabilia relating to old cars can take many forms, as the automobilia collecting section of the site probably shows. In the 1950s and 1960s there were several hand-held 3-D viewers available, through which exciting images could be viewed. Many subjects for 3-D viewing were covered, including animals, country scenes, transport, flowers, glamorous girls (popular with '50s dads I imagine!) and so on. Perhaps best known was the View-Master, into which a circular cardboard disc, containing lots of tiny images, would be placed and rotated, one at a time. Early examples were made from bakelite, and later ones in plastic. 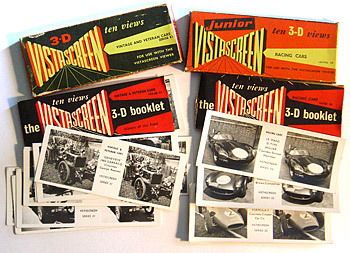 Shown here though are the photo cards used by a different 3-D viewer, this time the Vistascreen. I've not seen a Vistascreen viewer for real, so I can't comment on how effective (or not) it was. The two sets of cards outlined here are both transport related. The first, series 50, features ten views of 1950s sports & single seat racing cars. Cars included are: Aston Martin DB3S, DB3S interior, Jaguar D-Type, Lotus Mark X, Cooper Climax Formula 2, Cooper Le Mans Type sports car, Cooper Central Seat sports car, Maserati 250F, 250F engine, and the HWM Jaguar - photo courtesy of Duncan Hamilton. Each card has two views of the same image, one cropped slightly different to the other, which, when viewed through a Vistascreen viewer, would resemble a 3D view to the lucky child. The second set features the following Vintage and Veteran Cars: 1904 Darracq "Genevieve", 1899 Benz, 1897 Benz, 1913 Fiat, 1904 De Dion Bouton, 1901 Durkopp, 1912 Ford Model T, 1900 Peugeot, and a 1912 Delahaye from the motor museum at Beaulieu. Vistascreen packs were available from shops, and also from Weetabix, possibly in return for sending away tokens cut from cereal packets - perhaps someone remembers these offers? Whereas the View-Master was a well designed bit of kit, from pictures I've seen of the Vistascreen, it was a low-rent version of the former, with a holder for each card, and a pair of flip up viewing 'lenses' through which each image would be admired. A good photo showing the Vistascreen in all it's glory can be seen on this photo library site.